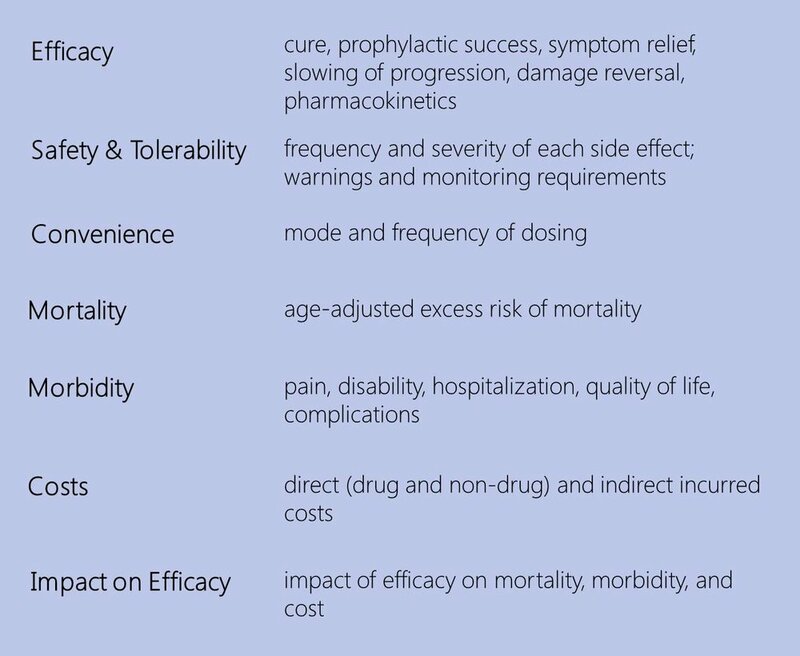 A drug’s clinical improvement strongly affects its commercial potential. The unique feature of our analytical approach is that we measure clinical improvement in an objective, rigorous, and consistent manner, and have validated that measurement against the performance for dozens of launched drugs. We measure unmet medical need to inform R&D decisions. A drug’s clinical improvement can be measured by quantifying its reduction in unmet medical need in the target population. We do this by first computing the level of medical need that remains given the current standard of care (SOC). That computation pours data from the peer-reviewed literature into analyzed using a standardized quantitative method. Importantly, our framework looks beyond product attributes and includes detailed analysis of disease burden – the mortality, morbidity, and costs inflicted by a disease. The higher the disease burden, the greater the potential for reducing medical need and creating value. A new drug’s ability to reduce disease burden strongly influences physicians’ willingness to prescribe and payers’ willingness to reimburse. For early-phase programs, our Disease Target Assessment tools allow program teams to quickly and inexpensively run “what- if” scenarios around the uncertain attributes of their drug. That process helps determine what combinations of clinical attributes will be required for the asset to compete. Outputs of the analysis include specific predictions about market access, pricing, patient share and revenue potential under alternative clinical scenarios. For drugs in late development, Equinox Group’s forecast models allow the team to quickly estimate the patient share and revenue implications of new information as it arises—new clinical or launch assumptions for their agent and for each developmental competitor. Here are some videos that tell you more about what we do and how we do it.